InPreflight Pro can package multiple jobs automatically with the option to collect all files into one folder. It eliminates the need to collect the same links multiple times for each design, saving gigabytes of disk space and hours of production time. 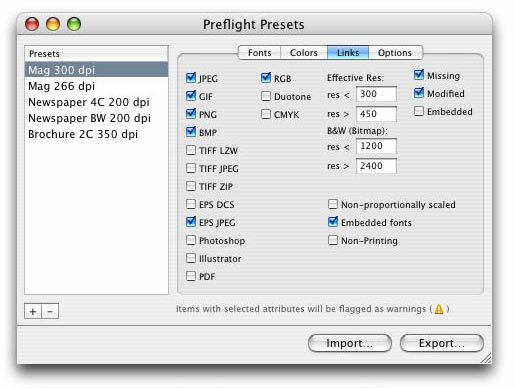 InPreflight quickly checks your files using powerful presets and lets easily locate potential problems, including hidden issues not detected by InDesign. The detailed fonts, colors and links info is shown in one window so you don't need to switch between several windows and panels. 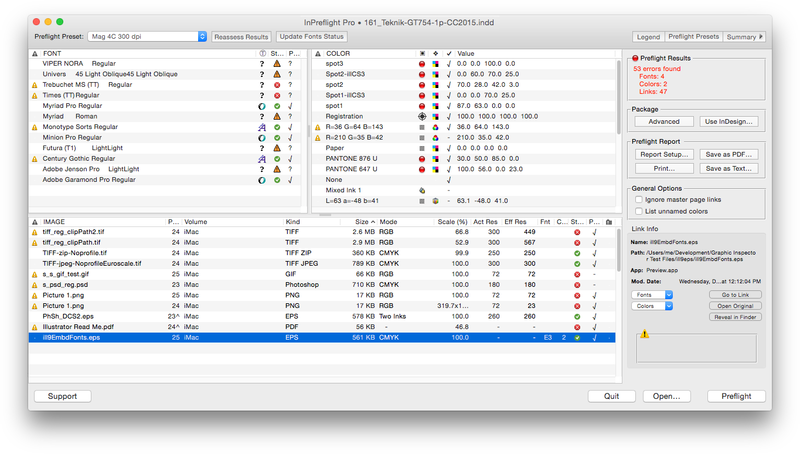 InPreflight lets you print graphic preflight reports and save them as PDF, providing an easy way to analyze, archive and send reports to service providers. 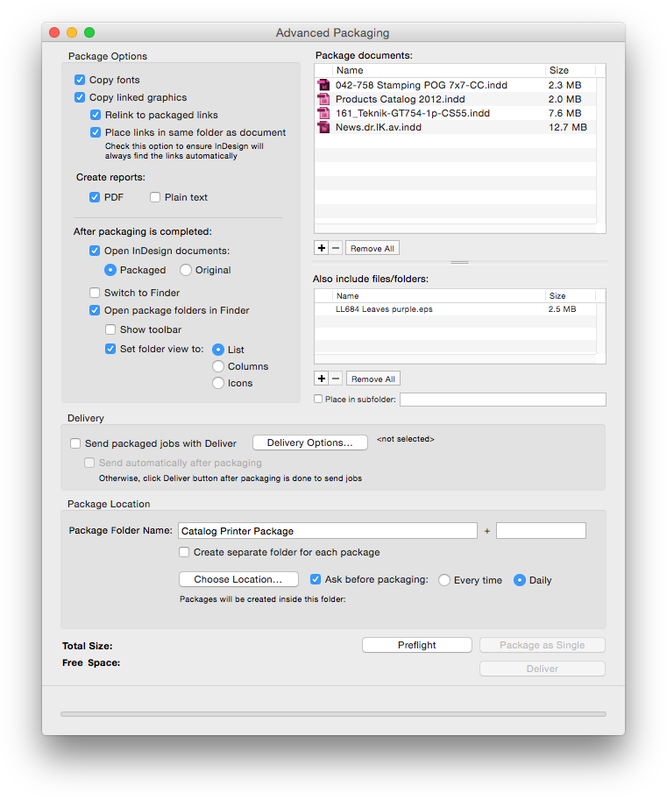 Automate packaging of multiple documents with the option to collect them all in one folder or separately. Collect all mutual files into one folder, so you don't need to collect the same links multiple times for each design, which can save gigabytes of disk space and hours of production time . ...or collect each job into a separate folder. 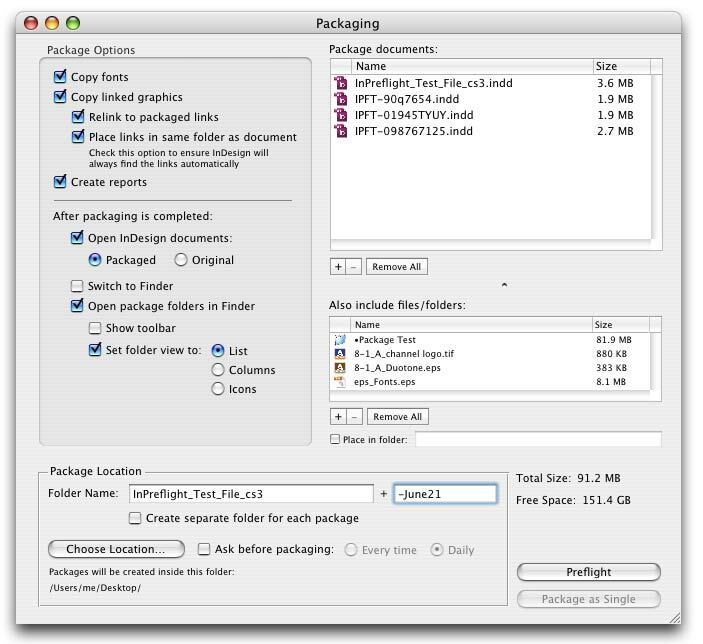 Add external files and folders to packages. Send packaged jobs over Internet and locally using seamless integration with Deliver. Sort preflight results by any attribute. Reveal potential problems not reported by InDesign, such as TIFF compression and embedded fonts (view detailed list ). Warn about "forbidden" names and locations. For example, warn about links which are not located in the folder "Hi-Res", or whose name contains "_random". Check color space, model, value and used status. Check documents for Registration color used in text. Check font type, status and PDF embedding permissions. 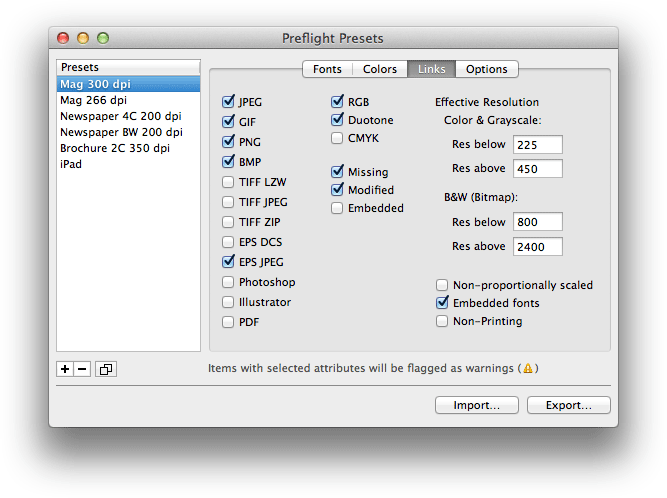 Create preflight presets for various job types, such as newspapers, magazines and spot color brochures. Reassess preflight results with different presets. Print and save reports as PDF. PDF report is like an interactive screenshot of InPreflight window with detailed link info saved in PDF comments.. Include complete Paragraph Styles report. Batch packaging is not available in InPreflight Studio. All other functionality is identical. 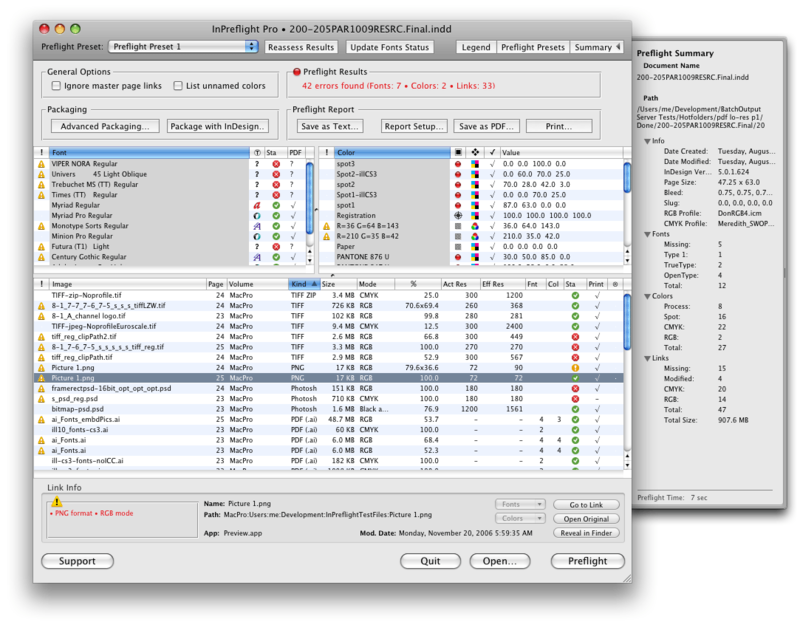 InPreflight Pro is the only program that can preflight and package multiple jobs. Among other abilities, it can collect all files into one folder, eliminating the need to collect the same links multiple times for each design. The savings can result in gigabytes of space and hours of production time. InPreflight conveniently shows info on all document fonts, colors and links in one window - no need to go through separate palettes and dialog boxes. Embedded fonts in Illustrator files (both EPS and native) can cause costly delays and confusion if you send packaged InDesign jobs to service providers. Such fonts are indeed embedded in Illustrator files so they can be printed without the actual fonts being installed. However, if users try to open the files in Illustrator, the fonts will be reported as missing - even though they are embedded. Your printer will require you to provide missing fonts, which can result in additional charges and missing deadlines, which can translate into hundreds of dollars lost. TIFF and EPS images can be saved with various compression options (LZW/ZIP/JPEG and JPEG respectively). Compressed images can be incompatible with various output equipment, such as imagesetters and printers of certain models. It applies to both collected images and the ones used in PDF files. These problems can result in costly delays, missing deadlines and additional charges by service providers. Depending on your workflow, you may store links in specifically named locations, or name them in certain way. For example, your lo-res link can be stored on the LO-RES OPI volume. Or your random scans have the text "_random" appended to their names. Such links can end up in your final InDesign files by mistake. If left undetected, they can cause a wide range of problems - from missing deadlines and service charges, to costly reprints and even lost clients. Which can translate from hundreds to hundreds of thousands of dollars lost. InPreflight can detect illegal names and locations according to your workflow specs, saving you from potential disasters. 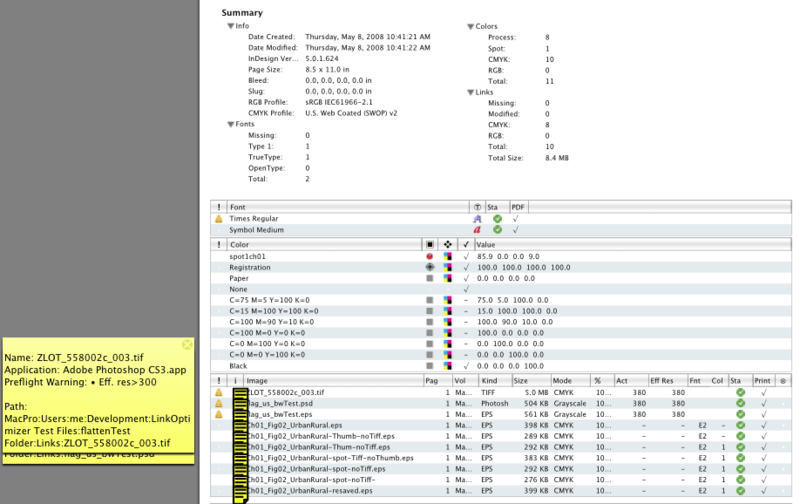 InPreflight reports are easy to analyze and understand... they look just like interactive screenshots of the InPreflight window. You can instantly print them or save as PDF files. 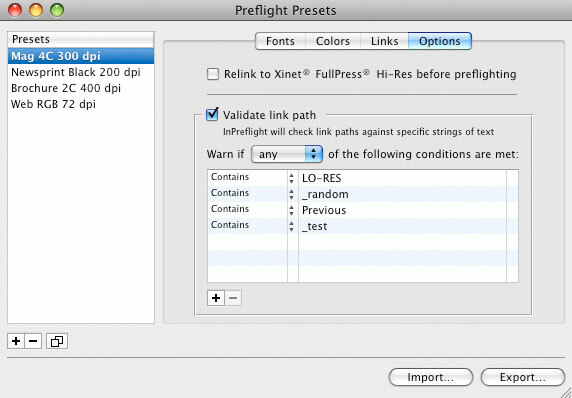 InPreflight reports many other link attributes not shown in InDesign, such as color mode of Illustrator files, raster EPS resolution, spot colors in Duotone and DCS files and others (you can find the detailed list in InPreflight user guide). Advanced Packaging is not available in InPreflight Studio. InPreflight is delightfully simple to use and does its job well. "Where has this software been all my life? Wow!.. 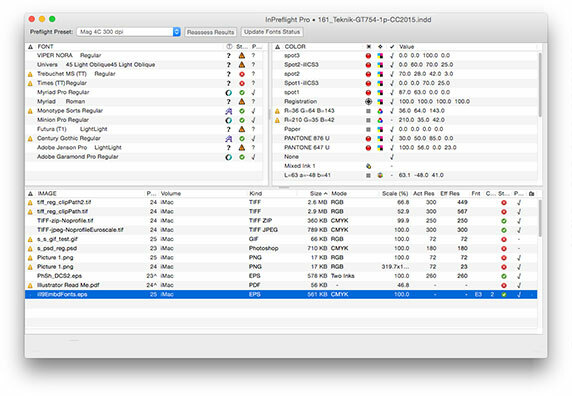 InPreflight just saved me about 9 hours work�"
"Love the program – a real time saver in prepress situations... InPreflight is great at finding problems ahead of schedule." © 2006-2019 Zevrix Solutions. All rights reserved.